Councilor to rector, Head of Chair of European Integration, MGIMO -Moscow State Institute of International Relations (University). Butorina O. (2006) “Principles of Monetary Integration and their Relevance for the CIS”, in Vinhas de Souza L., De Lombarerde P. (eds), “The Periphery of the Euro. Monetary and Exchange Rate Policy in CIS Countries”, Ashgate, Aldershot. Butorina O., Borko Yu. (eds) (2006), “The EU Enlargement and Russia”, Delovaya Literatura, Moscow. 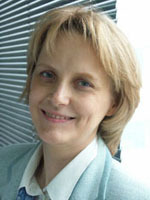 Butorina O. (2005) “New Approaches to the Concept of Regional Integration”, Cosmpolis, 3(13): 136-45. Butorina O. (2003) “International Currencies: Integration and Competition”, Delovaya Literatura, Moscow. Jean Monnet Chair – 2005 – 2008.